A calorie counter like no other! Just in time for the New Year/New You promotions, AMP offers a handy calorie counter that is beautiful as well as useful. Weâ€™ve taken our million-selling Pocket PoshÂ®format and packed this pretty purse-sized book with all the nutritional info you need for keeping your New Yearâ€™s resolution while enjoying your favorite foods. Complement your style while keeping an eye on your calories with the Pocket Posh Complete Calorie Counter. Compact, trendy, and easy-to-use, this handy guide includes all the nutritional information you need for keeping your New Year's resolution while enjoying your favorite foods. 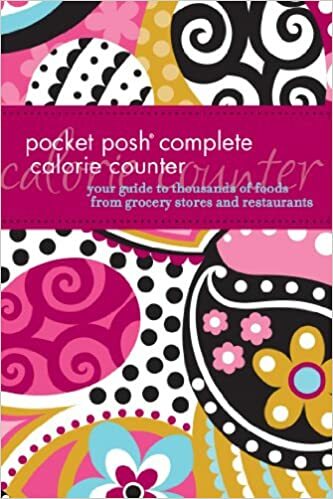 With nutrition and calorie listings for more than 5,000 general and brand-name foods and over 50 major fast food and family restaurant chains, the Pocket Posh Complete Calorie Counter is the perfect accessory for every calorie-conscious woman. ← The Everything Weeknight Paleo Cookbook: Includes Hot Buffalo Chicken Bites, Spicy Grilled Flank Steak, Thyme-Roasted Turkey Breast, Pumpkin Turkey Chili, Paleo Chocolate Bars and hundreds more!